A couple of Sundays ago, we celebrated the birthdays of our church members who were born in January and February. 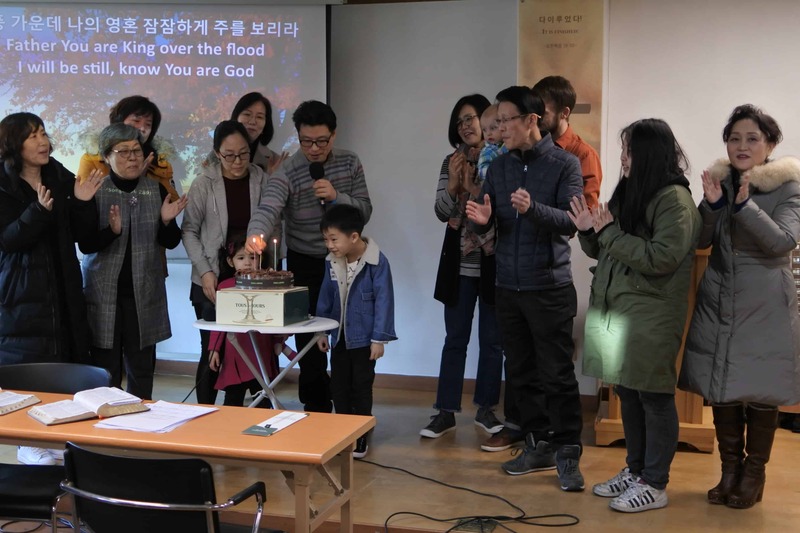 That’s something that you can do in a smaller church – bring all those people up on the stage, sing Happy Birthday to You, blow out the candles, and then pray for God’s blessing upon their lives in the year ahead. Our church is an extended family, ready and willing to adopt new brothers and sisters whenever they come through the front door. 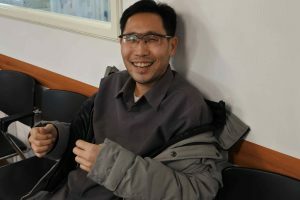 February brought our brother, Jongil Park, from the Philippines to our church via an unplanned but necessary visit to a hospital in Seoul. 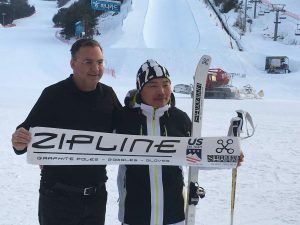 A few days later, another brother, Pastor Chuck Heidenreich arrived to briefly fellowship with our church before heading off to the Winter Olympic Games in Pyeongchang.It was a blessing to tag along for a day or so and see the qualifying runs of all the moguls skiers. 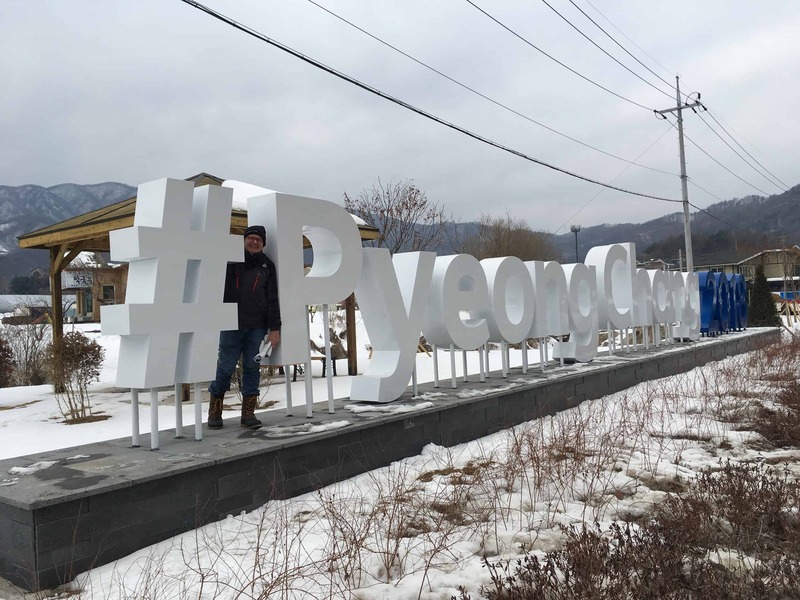 I remember when I first came to Korea the Winter Olympics in 2018 seemed far off. Now they have come and gone, and I was here to see a bit of them. It has been nearly four years since this family of believers at Grace Mission Church embraced me. The Sunday I returned from the Olympics, there were three new faces in our church. One was that of a pastor from India who discovered GMC on Facebook. He was passing through Korea after spending time in America. Another face was that of a retired librarian from one of the top universities in Korea. He had begun reading the Bible in English, and as an unbeliever, he was recommended by a Korean who knows of our church to attend our meetings to discover the message of the Bible. The third face belonged to a sister from China who came to Christ through the Greater Grace Church in Baltimore. She attended Pastor Shibley’s church in Silver Spring for a season before returning to China. When she returned to China, her only church option was the local, government-regulated Three Self church. 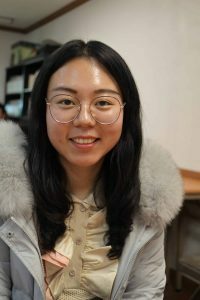 After praying, she sensed God leading her to South Korea to attend our church, so she got a work visa to teach English and Chinese, and she is our newest GMC adoptee! Being a missionary can mean being included in many family circles. Sometimes these families are all brothers and sisters in Christ, but sometimes there are only a few or even no believers in those families. The Wednesday English Bible study group at Paik Hospital includes some members who are believers and others who are not (yet). At Yeomyung School, some of the students in the English Bible class are already believers, but many are not (yet). I hope that all the staff members are believers at the pre-school where I have monthly ministry, but maybe some are not (yet). But the cool thing is that I am viewed as a family member in all of these places, and I have the liberty to share the gospel and the love of God with these groups and, at times, individuals within those family circles. 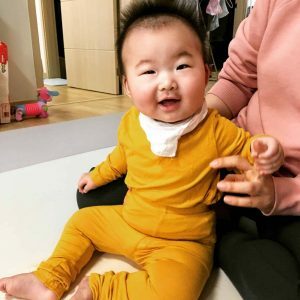 Recently I received a phone call from one of the first Korean friends I made outside of the church. I met him on my first trip to Korea, and we have stayed in touch since 2013. He called me to ask me a favor: He had to give a speech in English the next da y and he wanted me to travel to his home three hours away to help him prepare, even if that meant just conversing with him in English. He also wanted me to meet his wife and his 9-month-old daughter. To my knowledge, he is not a believer, but I continue to pray for his salvation. I arranged to go to him and spent the night with him and his family. As you can see from the photo, his daughter is adorable. My friend and I spent a few hours talking about how his life has changed since he became a husband and father. I shared some thoughts of encouragement and told him that having a life of faith in God makes a difference in many marriages. He invited me to visit again next month after his family moves, and he mentioned traveling with his extended family to visit an island off the west coast of Korea. He wants to include me in his family in this way. “God sets the solitary in families,” (Psalm 68:6). The previous verse says that God is a “father of the fatherless, a defender of widows.” Our God doesn’t want people to be isolated and alone. He wants each of us to be members of His family, and He sent His Son, Jesus, into the world to make this relationship possible. Jesus Christ is the foundation of the Church which includes all of our spiritual brothers and sisters around the world and in heaven, all members of God’s royal family. It is possible to be married and have children and still feel isolated and lonely. I see it clearly here in Korea. I minister to men who have brothers and sisters, a father and mother, many colleagues in their workplaces, perhaps even a wife, but no close friend that they can talk to about things that matter in their lives. And sometimes they seek me out, as an older brother or a friend. Sometimes I feel totally inadequate, but I listen and pray for God to put something helpful into my mouth if and when He leads me to speak. I, too, need people that I can reach out to when I need help, encouragement, comfort, and wisdom. This past month I spoke to Pastor Schaller and Pastor Scibelli by phone. 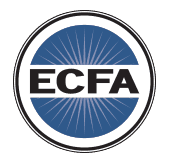 I chatted with Pastor Stan Collins online and exchanged emails with Pastor Brian Lange and Pastor Philippe Serradji. In a Pyeongchang hotel room, I talked face to face with Pastor Chuck Heidenreich. My mother and father are always available to me via FaceTime, for which I am very grateful. I am glad that God has set me in families. Thank you for letting me be a member of your family.